As part of the South Wales Literature Development Initiative, Literature Wales 350 year 5 pupils from Caerphilly, Neath Port Talbot, Newport, Torfaen and the Vale of Glamorgan will be enjoying a fun, interactive show by Chris Riddell, Children’s Laureate and the Welsh illustrator Huw Aaron at the Riverfront, Newport on Tuesday 8 November 2016. The idea for the Waterstones Children’s Laureate originated from a conversation between (the then) Poet Laureate Ted Hughes and children’s writer Michael Morpurgo. They considered it an appropriate and timely way to combine the celebration of excellence in writing and illustration for children with honouring individuals who have made a significant and lasting contribution to the world of children’s books. Quentin Blake was the first Children’s Laureate (1999-2001), followed by Anne Fine (2001-2003), Michael Morpurgo (2003-2005), Jacqueline Wilson (2005-2007), Michael Rosen (2007-2009), Anthony Browne (2009-2011), Julia Donaldson (2011-2013), Malorie Blackman (2013-2015) and Chris Riddell (2015-2017). Each Children’s Laureate has taken the opportunity to promote particular aspects of children’s books. These have included visual literacy, readers with disabilities, poetry, storytelling, illustration, drama, writing for young adults and more. 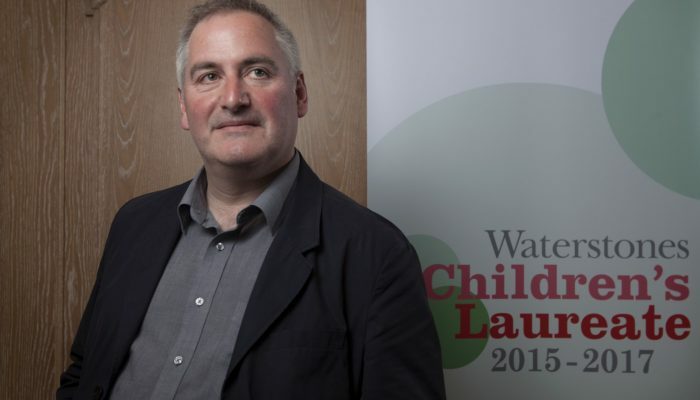 Chris Riddell, current Children’s Laureate is a prolific writer and illustrator whose work is familiar to both children and adults. He is known especially for his distinctive line drawings with their clever caricature, fascinating detail and often enchanting fantasy elements. He has won the prestigious Kate Greenaway Medal three times, in 2002 for Pirate Diary and in 2004 for Jonathan Swift’s Gulliver and in 2016 for The Sleeper and the Spindle. His solo work includes the Goth Girl series, theOttoline series and the picture books The Emperor of Absurdia and Alienography. The first Goth Girl novel won the Costa Children’s Book Award in 2013. He received the Hay Festival Medal for Illustration at the 2015 Hay Festival. In addition to his children’s books, Chris is a renowned political cartoonist whose work appears in The Observer, The Literary Review and The New Statesman. Huw Aaron is a Cardiff-based cartoonist and illustrator. His doodlings can be found in a number of children’s books and comic strips and he is a regular contributor to Private Eye, The Oldie and the Spectator. He is the illustrator for the branding of the Cardiff Children’s Literature Festival and is illustrating Steve’s Dreams by Dan Anthony for Firefly. Recently he has also written and illustrated the Welsh language comic/jokes/story/puzzle book Llyfr Hwyl y Lolfa. Huw has delivered a wide range of workshops for Literature Wales including as part of South Wales Literature Development Initiative, Cardiff Children’s Literature Festival, Dinefwr festival and Dylanwad.